Carousels show multiple images within a single BMZ container. The benefit is that you can provide multiple targeted marketing messages personalized for an individual. To define a Carousel, select ‘Carousel’ from the Content Type drop down. You will then see the Carousel settings container and the selected slides underneath. 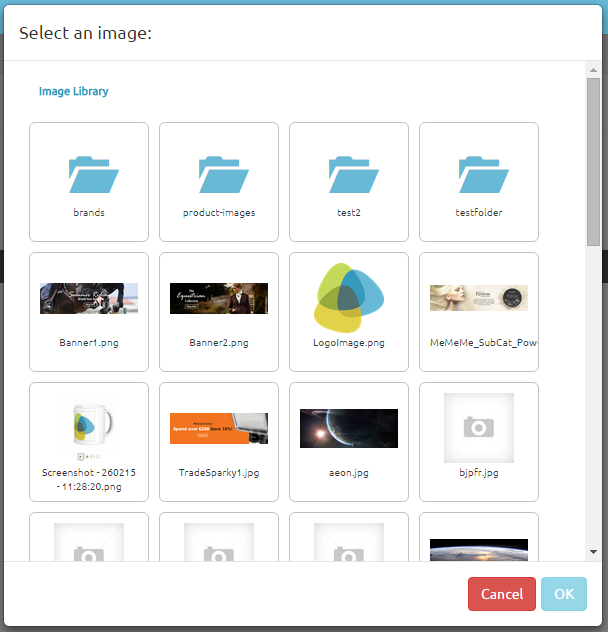 You will then be able to select an image from the Image Library. You will need to have loaded your image into the Image Library prior to selecting the image so that it is ready and available for you when you need it.Click on the image you want and then click on ‘OK’ to use the image. Please note, image and carousel content types will use the image file path URL as a way of knowing which image to display when loading on the site. If an image is moved in the library at any stage after you have created your BMZ content, the zone will no longer be able to find it. We advise you file away your images in a logical folder structure so that they don't need to be moved in the future, and of course if you do need to move an image, please remember to go into your BMZs to update the image location so that it finds it in it's new home. Firstly you need to change the Show Content button to "On" and then using the content box to add text and custom HTML. Using the top and left attributes help to determine the position of the content on top of the banner. The content will only be added onto the page that is currently selected. For each slide you can add links to direct the customer to another location on the site this is done by adding a link in the text box field with the label Link. Alt text can also be added for each image using the field Alt text. You can change the order of the slides by clicking 'Move Right/ Left'. To delete an individual image click the Delete Image and to save the changes click the Save Button.